The woman behind the restoration of Glasgow School of Art's fire-ravaged Mackintosh building has described the Notre-Dame blaze as "déjà vu". Liz Davidson described firefighters as "heroes" for saving priceless artefacts from both the iconic French cathedral and the Glasgow art school. She said they planned to offer to help and advice on restoring the historic building to its former glory. "We stand with the citizens of Paris... we share their pain," she said. 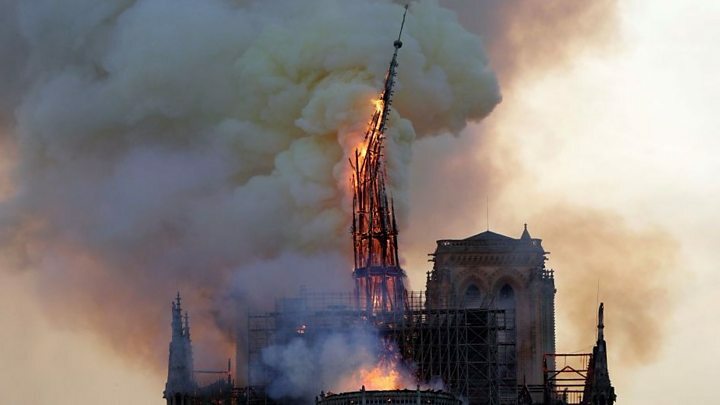 The fire tore through the 850-year-old Paris building's roof and caused its spire to collapse on Monday. But firefighters who worked through the night managed to save the landmark's main stone structure, including its two towers. The Glasgow School of Art library was lost in a fire at the Charles Rennie Mackintosh building in 2014. It was due to reopen after a £49m rebuild last year, but it was reduced to a ruin in a second fire in June. Ms Davidson, the senior project manager with Mackintosh Building Restoration, told the BBC News channel that she experienced "déjà vu" as she watched the flames engulf Notre-Dame. She added: "It's a very strong building and it seems to have come through that dreadful 24 hours as indeed our own Mackintosh building did. "It takes a long time to see that but it's stood up to a terrible beating but it looks as though it's still there today, which is great." She said that the fire at the Mackintosh building had a physical effect on people with strong personal connections to it. "We have been through what has been described by people as almost the stages of grief," she said. "It's incredulity and I think a lot of people at the moment will be standing on the banks of the Seine or watching the footage that you are broadcasting and not believing what they're seeing and then you get into almost not accepting it - it's too surreal - then anger, then acceptance." She said people form deep attachments with beautiful buildings, whether they married there or studied there. "Notre-Dame clearly is iconic. It's incredible, it's beautiful and it's one of those things that physically you feel the loss of that building," she added. Image caption Liz Davidson told the BBC News channel that Notre-Dame appears to have survived a "terrible beating". 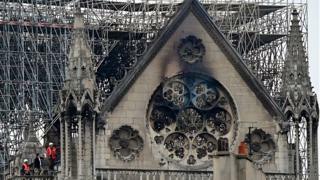 Hundreds of millions of euros have been pledged to help rebuild Notre-Dame, after French president Emmanuel Macron vowed to reconstruct the building even as the fire burned. The cause of the fire is not clear but officials say they are "favouring the theory of an accident". Ms Davidson praised the work of firefighters who saved the structure and rescued priceless artefacts in Paris and Glasgow. Among those items saved from Notre-Dame is what is said to be the crown of thorns worn by Jesus before his crucifixion. In Glasgow, valuable furniture was among pieces saved from the 2014 fire. "They are heroes," she said. She said innovative technology was used in the restoration of the Mackintosh building following the first fire and they would be keen to share their expertise with the French authorities. "We would be really happy to help," she said. " We will be writing to the Ministry of Culture saying these are the things we did - there was a lot of digital and quite innovative things... put in place within 48 hours. "There is a lot of new technology that we would be very happy to share or to send details or they could come and visit the Mackintosh Building as soon as they wish."